Four months before finishing my term as District Chairman I was asked to update our web. It might have been an oversight that I was not aware of - but nevertheless, ‘better late than never’. This our new District is in its second year and since August last year I have been busy organising a Joint District Annual General Meeting with District 330 which will take place on 21 to 23 March. Visiting various IW clubs in Sabah and Sarawak not only gave me great pleasure, but I enjoyed very much the warm hospitality offered by diverse clubs and its members. A big Thank You to all of you! Meeting the friendly fellow Inner Wheelers there was one thing. The excursions into the wonderful nature were other highlights, as I have not experienced before. Only through Inner Wheel I have had the chance to saviour it. But even working together with the three clubs in Singapore for a project “Child at Street 11” was a good experience, which gives us all satisfaction and a meaning to be an Inner Wheel member. 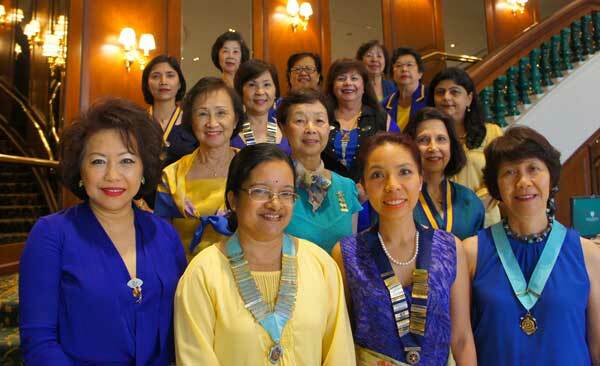 It is the combined effort of all three clubs in Singapore that we are able to put up a weekend program for all the delegates and members from other districts (Australia and New Zeeland) for the coming Annual General Meeting. During this intensive preparation we come to know each other even better and we bonded very well. I am thankful for all the helping ‘Inner Wheel Hands’ and the so sportive ladies who took initiatives to volunteer, either to model, to dance or to guide. Three cheers to you all, Hurray, Hurray Hurrah!